How long has it been since I read a really good horror novel? And how did I not realize going in that that's exactly what Sorrow's Knot was? I read Erin Bow's debut novel Plain Kate when it came out and was suitably impressed with her writing, even though the book as a whole didn't work for me perfectly. 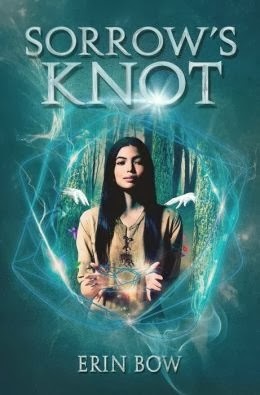 But as soon as I heard that her sophomore novel was to be an indigenous tale of ghosts and the generations of women who bind them, I felt certain I would be reading it as soon as I got the chance. It just sounded too intriguing to miss. I wasn't entirely sold on the cover, and now after having read it I kind of wish they'd gone with something darker (less mystic blue) to more accurately match the chilling content hidden within its pages. Because make no mistake—Sorrow's Knot is an unapologetically terrifying gem of a tale. In fact, it rather resists classification. It's fantasy, but oh, it's horror. It's young adult, but it's really very middle grade, too. It's sad. But its moments of happiness are blinding. Which is why you really must read it so you can find out what it is for you. Otter is the daughter of a long and distinguished tradition of binders, the women of her pinch who protect their people from the rising dead. Her mother Willow is widely expected to be the greatest binder who ever lived. And that is taking into account the legendary Mad Spider who set the standard for binding and setting wards and holding off the deadliest of all undead: the White Hands. And so Otter's life has been open and sure, certain in the knowledge that her path would take her in the footsteps of her ancestors, that one day she, too, would take up the calling as binder for her people. And life has been good. Together with her two best friends the ranger Kestrel and the storyteller Cricket, she's been free to run and laugh and play tricks on the more grave elders of her band. Until the old binder Tamarack dies and her mother Willow reluctantly steps into her shoes. From that day on, nothing is right. Sure that something is wrong with the knots she ties to bind the dead, Willow drifts farther and father away from them. As her mother's words and actions become more erratic, Otter's fear grows. And then one day Willow reveals she will never take Otter as her apprentice. And Otter's life unties itself before her very eyes, her footsteps haunted by the terrible secret behind her mother's decline. Otter tried to breathe deep, but each breath made her shudder and shudder. Kestrel put her hand between Otter's shoulders: steady. The summer stones were rough and warm to the touch. They were not alive, but if they were dead, it was a simple kind of dead: They were only themselves. They needed nothing. Otter was thinking this and not watching the world, and so when someone moved just behind her, her heart leapt like a startled grasshopper. She spun and had her bracelets thrust up before she saw who it was. "Once our dogs were wolves," said Cricket, when no one answered him, "and though we loved them, we watched them carefully." Kestrel half laughed. "They're watching Willow." "No, they're sure she's rabid." He turned to Otter. "They're watching you." Otter trailed along the edge of the sunflower row, away from the lodges and the open space of the palm. She could feel the eyes of the pinch on her back. "I didn't do anything," she said. "It's only that I'm—I'm—" This girl is a binder born. "—her daughter." Slowly they walked away from the lodges of Westmost, as if they were deer browsing. As if they were not afraid. Kestrel put out her hand and skimmed it along the top of the grass as the meadow became wilder. "What happened?" said Cricket again. "Have mercy on a storyteller: Tell me a story." "It's not just a story," said Otter. Something broke out of her that sounded like anger. "They never are," said Cricket softly. Those three. They form the magnetic center of this wild book and I loved them so very much. What a beautiful rendering of a trifold friendship. The playful storyteller, the stalwart ranger, and the tier of powerful knots who walks with the dead. I would have followed the three of them anywhere. And, in fact, I followed them much farther than I expected or (in some cases) wanted. Their story is deceptively small, geographically as well as emotionally. And while the marvelously imaginative and complicated rules and history of Otter's world exist on a grand scale, the whole thing rests very much on what it means to three children who have grown into their adult roles and found the world a larger, infinitely more disturbing place than they believed it to be. Which leads me to the White Hands. I'm still repressing shivers, days later, my friends. The alarmingly apt descriptions of the quiet ways these beings kill you had me glancing up for reassurance on a continual basis. I couldn't bear their encroaching presence around the characters I'd come to care for. To be honest, the bleak, growing dread of it all got to me at one point and I had to put the book down and come back to it the following evening when I had a little more perspective (and summoned a little more hope). This may or may not have coincided with a supremely sorrowful moment. Suffice it to say I spent some time grieving. It's oppressive at times, but in an undeniably well-crafted way. When I did return, I read it through to the end, closing the book wholly satisfied, if a little winded. The unexpected, understated, and sweet romance in the last third of the book may have had a little to do with my sigh of contentedness at the end. It's a story I will remember for quite some time, and one that really should not be missed. Recommended for fans of Tiger Lily. I know. The Book Smugglers - "This is a beautiful, sorrowful book." Dear Author - "This is exactly the kind of book I want when I say I’m looking more multicultural fantasy." Ivy Book Bindings - "I can certainly promise you one thing: it'll leave your hearts in knots." Late Nights with Good Books - "Thank goodness for these impressively rendered fantasy standalones." And now for the giveaway. We've got three copies of Sorrow's Knot ready and waiting for three lucky readers. To enter, fill out the Rafflecopter. The giveaway will run one week from today (11/18). Good luck! Currently reading Tenderness by Robert Cormier, and ANYTHING by Cormier is guaranteed to be dark and twisted. I agree with so much of this - I did not expect anything about this book going in, and I definitely followed some characters farther than I wanted. I really need to read Plain Kate now. Like you, this novel had me quite entranced. It's very deliberate and beautifully written. And the trio's friendship just broke my heart. In a good way, primarily. Like I said on Twitter, I didn't realize this was a horror book even though I've read the premise. Really curious about it since I've seen other bloggers rave about this and rate it as one of the best books they've read this year. Plus you just compared it to Tiger Lily and that one was such a lovely read. That's okay -- I didn't realize it was a horror book either! But yeah. Fair cop. I LOVED Plain Kate so much. Erin's second novel sounds DELISH! Oh forgot to mention the last scary book I read! I'm actually reading Doctor Sleep right now. Major herby-jeebies happening! Aw, this sounds good! Definitely going on a wish list. I don't read much horror, but Stephen King's Dark Tower series was often really quite disturbing. The last scary book I read was "The Killer Inside Me" by James Thompson. An oldie but a goodie! This is a lovely, lovely review. Thank you. This book looks amazing! I haven't read a horror book in a long time...I think the last one I was genuinely scared after I read it (like afraid to go to sleep at night) was...The Time Machine. Those underground creatures were creepy! Needless to say, I need to read more scary books! The last book that induced a physical fight or flight response in me was The Da Vinci Code by Dan Brown.